We were huddled around the steering wheel, laughing at ourselves. Our idea for a pre-dawn start disappeared about seven hours prior. We thought we could just pull into town, find the trailhead and start our ride. For this treasure hunt, maybe we should’ve bought the map. 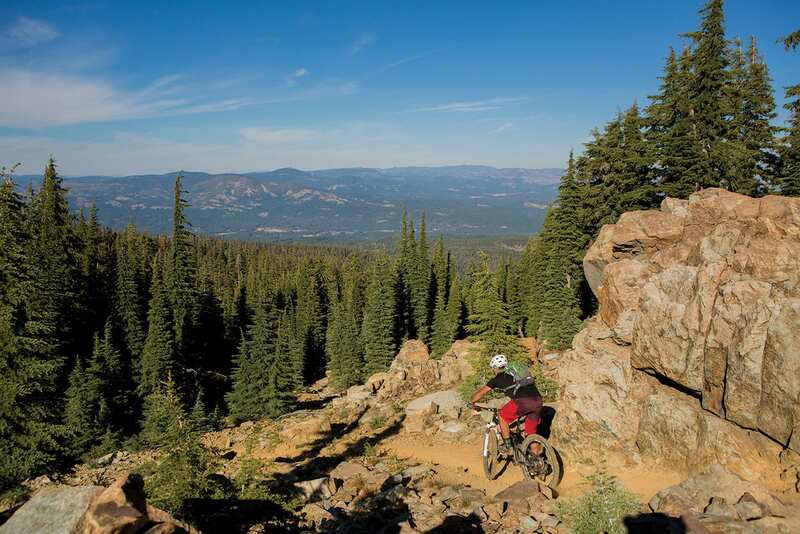 It was already early afternoon, pretty late even for a local ride in the Tahoe Basin. 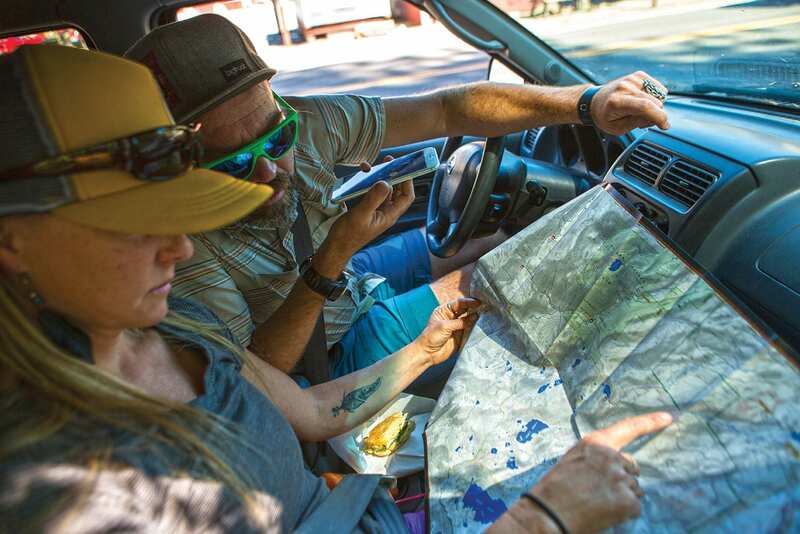 After an assortment of last-second stops in Truckee and a meandering drive north on Highway 89, there we were, Jay, Jason, Crystal and me, huddled together in the truck at a gas station parking lot in Graeagle. Bottom line is we did no research. We knew the name of the peak we wanted to ride—Mt. Elwell—but the bike store in town was closed and we needed a map. After repeatedly gazing at the handwritten “Be back in 20 minutes” note on the window of a local bike shop, we finally moved on to the general store, where, low and behold, we found the map. It was a fitting way to start our exploratory bike mission into this alpine wonderland known as the Lost Sierra, much of which lies within the spectacular Lakes Basin Recreation Area. 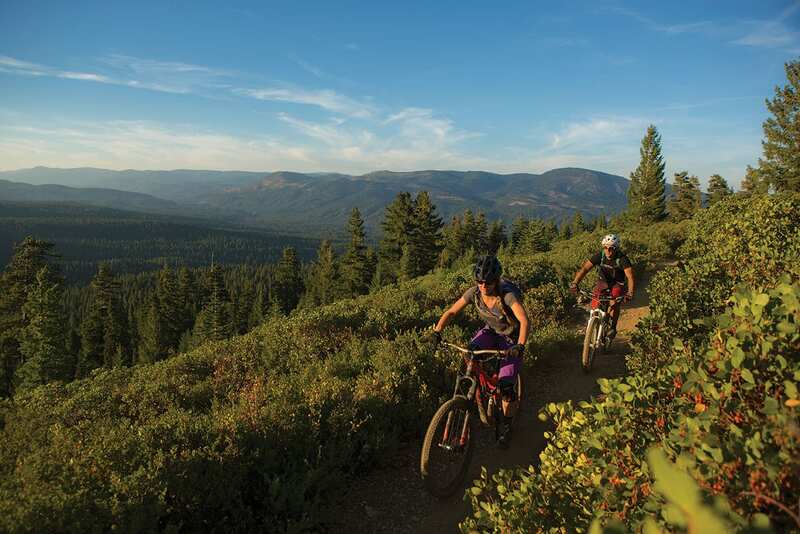 In this corner of the Northern Sierra, the views stretch past unknown peaks and endless swaths of national forest. The region as a whole is a nature lover’s paradise dotted with abandoned mining communities and countless miles of paved and dirt roads. It is also home to some of California’s richest mines historically—as well as one of the most mysterious tales ever passed down from the state’s famed Gold Rush. The history of the Lost Sierra can be traced back to a wild claim made by a hopeful gold prospector named Thomas Stoddard. Like many stories of Gold Country lore, various accounts exist. What is certain, however, is that Stoddard spread word throughout the region about a lake high in the mountains that was rimmed with gold nuggets. Backing his story with large specimens of pure gold, Stoddard led an expedition in search of this fabled lake in what became known as the Gold Lake Fiasco of 1850. Among the various accounts, one version begins with a miner named W.C. Stokes, who took in Stoddard for a night at Frenchman’s Bar near the small town of Washington. Over dinner, Stoddard relayed the fantastic tale of a lake that he and several companions had discovered in the vicinity of Yuba Pass with gold resting on its shores. Stoddard claimed to be gathering the chunks of valuable metal when a band of Native Americans attacked his group, leaving him as the only fleeing survivor. Stoddard returned weeks later with an assembled group of more than a thousand men. But when approached by Stokes, he refused to acknowledge that they had met. Stokes, who was suspicious of this behavior, warned the expedition to heed warning of Stoddard’s claim. But to no avail. The group set out into the mountains behind Stoddard’s lead. After visiting numerous lakes, none of which matched Stoddard’s description, the frustrated men gave him an ultimatum: Lead them to the lake within 24 hours or hang. Stoddard escaped that night under the cloak of darkness. Now mid-June, the disappointed expedition disbanded, spreading out in search of their own riches. While this so-called “Gold Lake” was never found, many of the miners did in fact strike gold along the many rivers and streams in the region. Rumor spread of these discoveries, and the floodgates opened to thousands of prospectors who poured into the area during the summer of 1850 and beyond. When we finally geared up and began to ride, the trail we discovered—with help from our new map—dropped smoothly through loose rocks and dust as we cruised with big smiles on our faces. Large hunks of granite littered the trail as we reached a quick section where we had to walk. Fresh water was abundant, as was the sweat trickling down our faces as the afternoon sun began to bake. Moving onward, we passed a couple gorgeous lakes and began to climb out of a basin toward the summit. We had reached the fabled climb a few had a mentioned before we left. We powered upward until pedaling became more of a chore than anything that resembled a good time. I knew right then that this was the hike-a-bike section we’d been warned about. The temperatures sizzled as I put my 29-er on my shoulder and started hiking up the summit. Like any adventurous soul living in the mountains, the search for new destinations and new places to ride is always fresh on the mind. After years of riding the epic trails at Downieville and throughout the Tahoe Basin, our road led us to a quieter side of the Sierra. The crowds in this area consist of tourists, Pacific Crest Trail thru-hikers and campers in search of a lesser-known locale on peaceful lakes. For us, it was the opportunity to ride trails that aren’t over-traveled and hold that sense of the unknown. As we crested the summit, a warm breeze rolled through and we decided to ditch our bikes for the moment and hike to the nearby true summit. Beautiful views stretched in all directions from the Sierra Buttes to Lassen Peak and rolled onward to the fertile valleys to the west and the arid deserts of Nevada to the east. After a snack and some water, the real fun began. 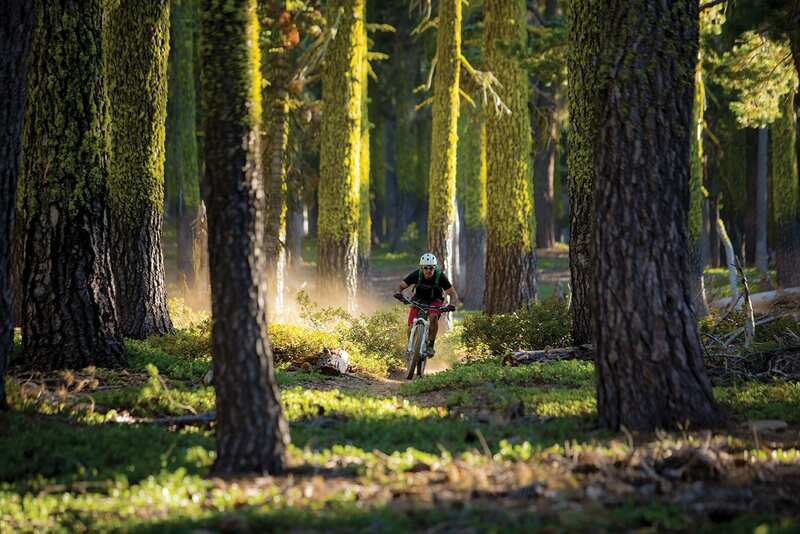 We clipped in and flew down what seemed like endless miles of downhill through forests of fir and pine. At times the trail flowed smoothly as mossy tree trunks whizzed by in flashes of green. Other sections gave way to bumpy, rocky terrain whose turbulence could have blended a milkshake. Views came and went as we descended into a dark, dank, fern-covered section of trail. We rode upward through a final climb as the Sierra sunset sunk in the west, leaving behind a perfect mixture of speed, endurance and adventure in our wake. Like the miners of old discovered, the Lost Sierra holds endless treasure—all you need to do is start looking. Ryan Salm is a Tahoe City–based photographer and writer. Find more of his work at www.ryansalmphotography.com or follow him on Instagram at @ryansalmphotography.